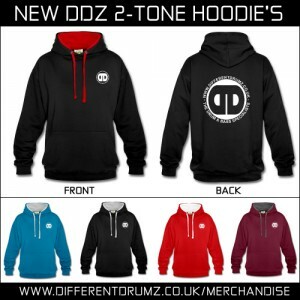 Here at Different Drumz we have a wide variety of drum and bass merchandise for all seasons ranging from ‘Flip Flops’ and ‘Caps’ for sunny days on the beach to a wide selection of T-Shirts and our all new ‘Two-Tone Headphone Hoodies’ to keep you warm in the winter months! Our product list includes T-Shirts, Vest Tops, Caps, Hoodies, Flip Flops, Mugs, iPad Covers and even Teddy Bears! We often have various special offers in our dnb merchandise store from discounts with up to 30% off all orders to free worldwide delivery and more! To take advantage of our special offers simply check out the banner at the top of our drum and bass merchandise page and enter the code provided when you get to the checkout. Also make sure to keep an eye out around the site for our news updates on special offers and discounts. Our special offers and discounts are limited time promotions so you will have to make sure you get in there quick if you don’t want to miss out! We are proud to introduce our new range of Different Drumz Two-Tone Headphone Hoodie’s that we have recently added to our dnb Merchandise store! These beauties come in a range of sizes and colours and are available to ship worldwide too! So why not wrap up warm in style as we head back into winter and share a little bit of dnb love on the way!